Hello Monday! Hope you had a great weekend! On Friday, it was my birthday! I celebrated with my family at my favorite pizza restaurant! My husband made my red velvet cake for dessert! Delicious! Saturday was full or errands and chores! It was fun weekend, but they always go so fast! 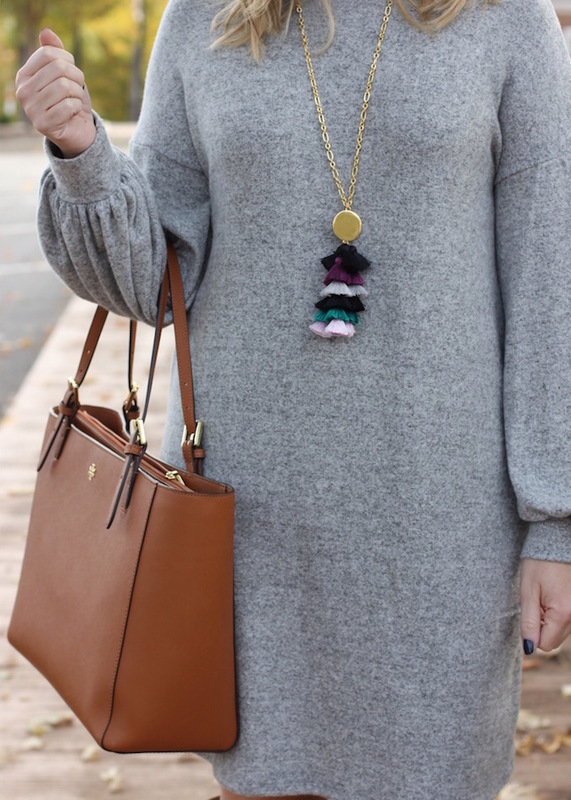 Love this dress and that fun tassel necklace! Love that dress, it looks so comfy and your necklace is so cute. The sleeves on that dress are SO good! You look amazing in that dress and the boots are fabulous too! Happy Monday! I sooo love the sweater dress dear. Looks really comfy and warm, yet the style is simple and chic.